Place 1 or 2 drops in each eye up to 4 times a day or as directed by a doctor. Medicinal Ingredients: Tetrahydrozoline Hydrochloride 0.05% w/v, Zinc Sulphate 0.25% w/v. Non-medicinal Ingredients (alphabetically): Benzalkonium chloride, boric acid, disodium EDTA, sodium chloride, sodium citrate, water. If you experience eye pain, changes in vision or if irritation persists or increases beyond 72 hours, discontinue use and consult a doctor. Do not use if you have glaucoma or serious eye diseases. Overuse of this product may produce increased redness of the eye. Keep out of reach of children. If swallowed, contact a Poison Control Centre or doctor right away. Do not use product while wearing contact lenses. If solution changes colour or becomes cloudy, do not use. 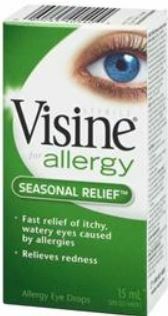 Visine is produced under sterile conditions. To help maintain sterility, replace cap after use and do not touch dropper to other surfaces.